ABiSee is a leading worldwide developer and provider of easy to use electronic readers for the blind and visually challenged. Click here to access the ABiSee web site. 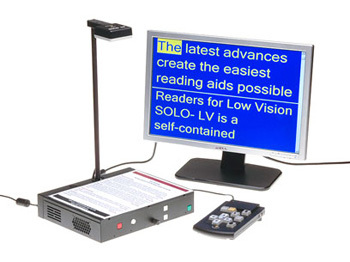 The ABiSee Eye-Pal SOLO is an instant reading device for those experiencing vision loss, enhancing independence and enriching lives. The device reads aloud almost anything printed- books, newspapers, mail, labels, bills, instructions on the food packages, even text on a crumpled piece of paper - quickly and easily. And it's so simple to use that anyone can use it right out of the box. The Eye-Pal SOLO was developed to enable anyone who is blind, lower-vision challenged or neurologically disabled to easily get the content from any printed text and "read" with their ears.